I’ve always wanted to try poaching pears, and I have seen it done so many times on My Kitchen Rules that one night I decided to give it a go. The verdict was a thumbs up from the family, and as long as you make sure your pears are cooked through but not over-cooked, it’s relatively easy. Having said that, remember that I wasn’t cooking for an army of hungry people who wanted their dessert NOW!! I was only cooking for family, so getting the pears right wasn’t too difficult. My no. 1 tip would be to buy pears that are as close to being the same size as possible. 3 large (about 280g each) just-ripe Beurre Bosc Pears, unpeeled, cored, cut into thick wedges. I quartered them. Low-fat Natural Yoghurt or Ice-Cream to serve. Yes, I went for the Ice-Cream!! Using the saucepan you plan to cook the pears in, trace a circle onto a piece of non-stick baking paper and cut it out. Combine the water, sugar and cinnamon in a large saucepan over low heat. Cook, stirring for 2 minutes or until the sugar dissolves. Add the pears and stir to coat them in syrup. 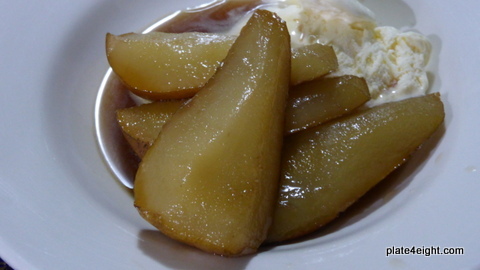 Place your baking paper circle on the surface of the pear and syrup mixture and cook, covered, for 10-15 minutes or until the pears are tender. Using a slotted spoon, transfer the pears to serving bowls. Increase the heat to high and bring the syrup to the boil. Continue to boil uncovered for another 5-10 minutes or until the syrup thickens slightly. Drizzle the syrup over the pears. Serve immediately with yoghurt or ice-cream.